As you might have noticed, everyone once in a while I try to use our blogs and our postcards to highlight a cause larger than ourselves. Like this year’s elections. 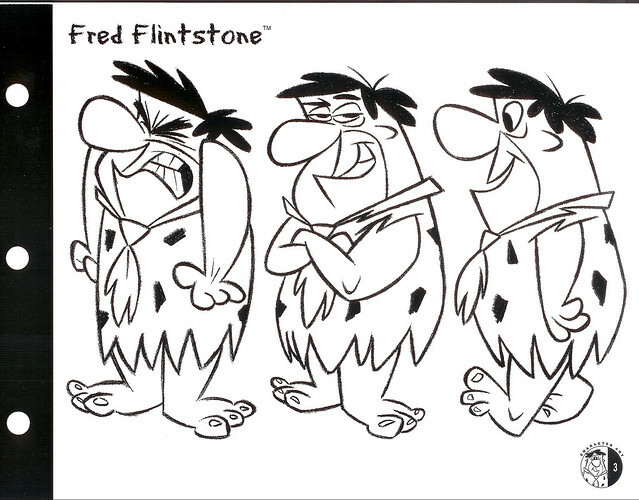 This Flintstones style guide was one of the last projects I oversaw as the last president of Hanna-Barbera cartoons. But it was probably one of the first things I wanted to accomplish. Shortly after I joined the company I had an enlightening dinner with John Kricfalusi where we got to know each other. In addition to discussing some first principles of cartoon making (where I told John to my thoughts about doing classic-type shorts and found out he’d thinking along the same lines; I guess there are no original ideas) John told me about his frustrations about the ‘evolution’ Hanna-Barbera’s classic characters had taken since the early 1960s. He introduced me to master designer Ed Benedict, one of his heroes, who’s designed everyone from Huckleberry Hound, Yogi Bear, and The Flintstones. And how HB’s cutifying and firming up the modeling of the characters had actually completely robbed them of their personalities. John made perfect sense to me and solidified an ignorant instinct I had about the lessening of the vintage Hanna-Barbera shows that started losing their power around the time of The Jetsons. It became one of my missions at the studio to restore the power of the great, funny drawings in the company’s heritage. So, in addition to the resurrection of the a shorts program I tried to instill a passion for the great designs that built the joint. Boy was it hard. For thirty years the culture had re-developed around the cute, squat, and dull designs that emerged around the early/mid 60s; it had convinced itself that that art was the ‘good stuff’ and the earlier models were crude, inexact, and ‘bad.’ But, as the young artists started to re-populate the ranks, their interest in the original designs and animation started to take hold and eventually led us to master artist Craig Kellman (now working primarily with Genndy Tartakovky’s Orphanage). Not more than 25 in 1996, Craig was commissioned by HB Licensing Creative Director Russell Hicks to completely redesign the licensing guide that had come out just the year before. And wow did he take to it. Hundreds –probably thousands– of drawings poured out from Craig’s desk. Superior drawings too, too great for someone of his tender age. But, one by one, anyone could see their power and their humor, and soon enough we completely republished the style guide, a “redux” if you will. Check out the drawings above and you’ll see how much Ed’s influence was on Craig, but also the pathetic, enemic versions that have dominated for the last 50 years. Alas, we were a little too late. Seemingly within minutes after publication Ted Turner sold Hanna-Barbera and Cartoon Network to Time Warner. No one there really gave a crap about old or new designs, and the Cartoon Network executives with senior responsibility were more interested in their employment than the studio. A few of them –Mike Lazzo, Linda Simensky, and Brian Miller– thankfully had enough juice to get a 90 minute special,”On the Rocks,” produced using the models. But, by then, The Flintstones had lost their mojo and the film went pretty much unnoticed. But, don’t fret. The designs exist forever, and one day The Flintstones will come back, with a passionate advocate steering them to wonderful comedy greatness. In the meantime, enjoy some of Craig’s designs. 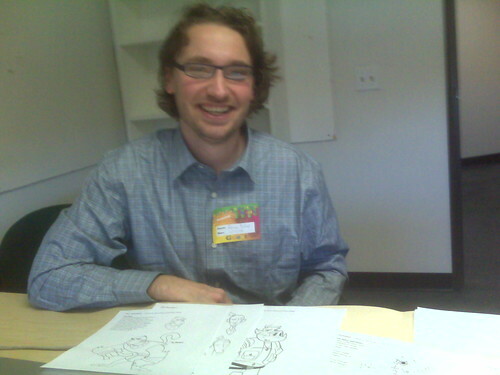 Brown Johnson was on our blog back when we were on Blogger and I called her one of animation’s great star executives. Today, Variety reports she’s been named President of animation at Nickelodeon, our home studio for kid projects for the last 12 years. Brown’s going to make a great difference in the cartoon business, she’s still a great star. Brown Johnson, the architect of Nickelodeon’s hugely successful preschool division, has been tapped to tackle the company’s animation business. At the same time, Johnson will continue to handle preschool programming — which includes Nick Jr. and the recently expanded 24-hour cabler Noggin. Johnson will commute between New York and Los Angeles, with an emphasis on getting to know Nickelodeon Animation’s large West Coast studio in Burbank. Until now, Nickelodeon development exec VP Marjorie Cohen oversaw both animated and live-action programming. But with the channel continuing to add more live-action product to the mix, Cohen will now focus on that world. That allowed Nick to create an animation presidency for Johnson. 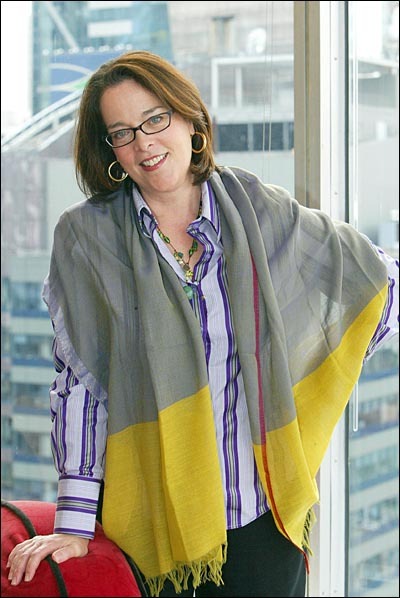 Johnson will continue to report to Cyma Zarghami, president of Nickelodeon and MTVN Kids and Family Group. Johnson said she’ll spend much of the coming weeks getting to know animators and producers handling work for Nickelodeon. Johnson also takes over the animation side just as the division expands its output and starts focusing on other platforms, such as mobile and VOD. Nickelodeon airs about 90 hours of animated programming per week. The network’s animation studio will increase its output by 50% this year — with 225 half-hours delivered. Studio will also produce 29 hours of CG animation this year. Johnson first joined Nick in 1988 as exec in charge of production, before turning her attention to the preschool world in the early 1990s. 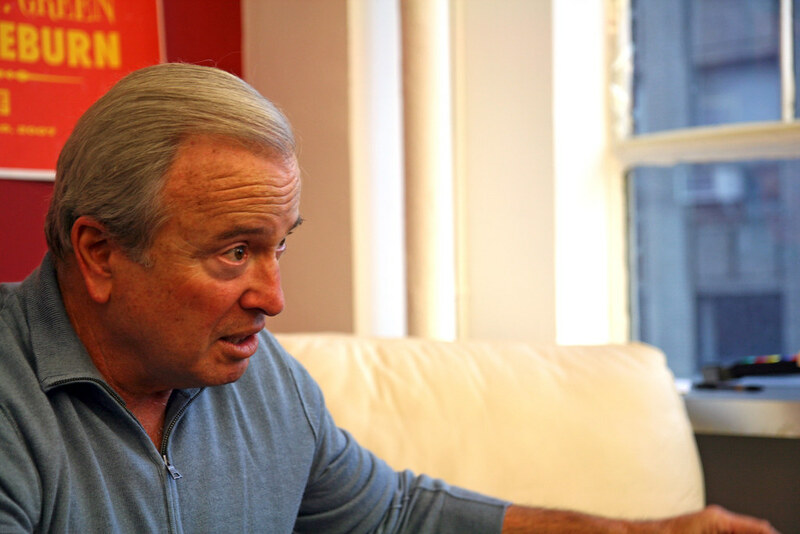 Ken Auletta in the house. I started reading Ken Auletta’s wonderful books at the suggestion of my lifetime friend Nick Moy and have never been disappointed, especially as he switched his beat over towards media, my consuming interest. It’s rare to find a thorough reporter who’s also a compelling writer. So I was more than flattered when my partner Herb Scannell suggested Ken talk to me about a future book he’s planning. Afterwards I walked him over to meet David Karp, someone who knows a lot more than I do. So after a leisurely holiday break (and an anniversary New Years poster) we resume our postcard series, with a reminder to everyone about our New York animation jam. Two of our cherished Random! creators. Adam Muto needs a portrait for film festivals, so he turned to his close friends Pen Ward. Adrian is founder of the Bloom Animation collective in Denver. We met when I spoke at ASIFA/AIGA/Rocky Mountain College of Art + Design last year. He stopped by Frederator/Burbank to show me one of his projects and find out a little about the cartoon biz in Hollywood. Our good friends Rita and Hadley from Radar Cartoons came by Frederator/Burbank to tell us some stuff about their Radical Cute project, and talk a little bit about plans for Boneheads. All the robots fit to play. 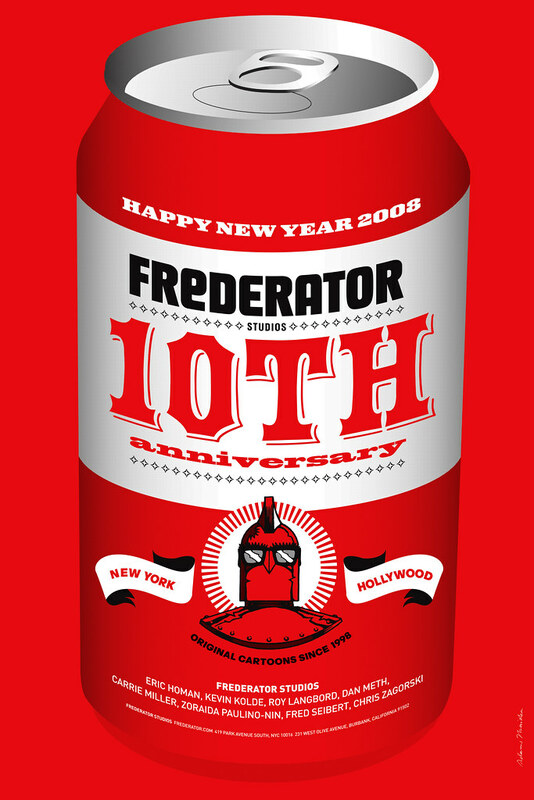 The Frederator New Year Poster 2008. Anyone who’s known me for just a little while knows I’ve got a jones for posters. So almost every year starting in 2002 I’ve commissioned a New Year’s poster from some of our favorite artists. This year is a big one for Frederator. 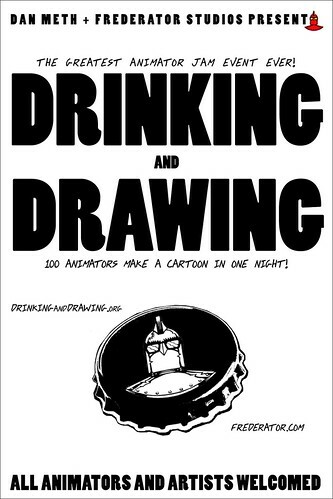 “Original Cartoons since 1998″ has been our slogan for a decade, as good excuse as any for a special poster. This year’s –which we send out to some of our closest friends and associates– was designed by Los Angeles studio Adams-Morioka. 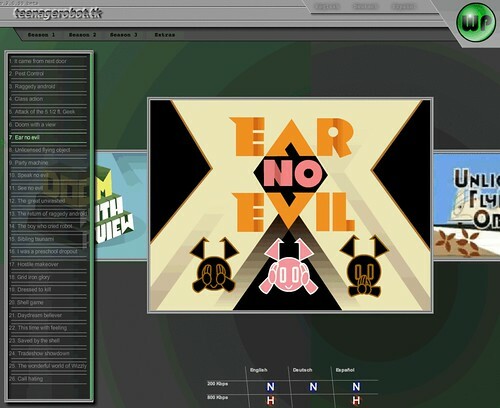 Sean Adams and Noreen Morioka have been the graphic designers most associated with Frederator Studios from our founding in 1998. They’ve designed our logo, one of our coolest set of postcards, and the first annual Channel Frederator Awards program, among dozens of other ephemera. If all that wasn’t enough they’ve also authored a couple of must-have design books in the last couple of years. I’m flattered they agreed to design for us at this very special moment.